A group of prospective students walk through the lobby of Eppley Auditorium on their campus tour when they spot Grant Turner, a sophomore, napping on one of the couches. The student ambassador has to think quickly about how he will address the unusual sight, as its not part of the tour. “Well, as you can see, the furniture in our buildings is so nice that you can’t help but fall asleep on it.” They all awkwardly laugh as a groggy Grant pretends to keep sleeping to avoid any interaction with his audience. Grant gets a quick nap in between classes in the hallway of Roadman Hall. Turner is a sophomore business major who commutes to campus. Most students who live on campus go back to their rooms in the residence halls if they want to take a nap between their classes. Since he doesn’t have a room to return to he began taking naps wherever he could. So far the only buildings he hasn’t slept in are the apartments on campus and the Allee Gym, which happen to be the two buildings he has never entered. Insomnia is a condition where a person has difficulty falling asleep or staying asleep, even when a person has a chance to do so. It is a common problem for adults, effecting nearly 30 percent of the population. The two most common symptoms are waking up feeling unrefreshed and waking up multiple times a night. Turner asked that we meet to conduct this interview at his favorite nap destination: the couches on the upper level of the Eppley lobby. He says that even in the winter the lobby of Eppley is very warm and there is always music playing. This mixed with the general comfort of those couches makes for a pleasant napping atmosphere. 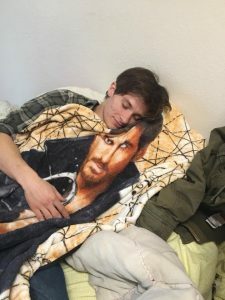 “One of my favorite times to nap is during college choir so I can hear pretty voices as I drift off to dream land.” He also spends a lot of time in Eppley because of his music minor. He says that a lot of buildings on campus don’t lend themselves to napping. The HYPR is one that came to his mind. “There’s too much noise and no place to lie down.” Another building he doesn’t enjoy much is the Walker Science Center. He described it as cold and hospital-like. Aside from that he says the all buildings have their own merits when it comes to napping. College students have a long history with napping. Research shows that napping helps enhance memory, learning, and motor skills which is useful for students. As the New York Time reports, some colleges go as far as to build nap pods for their students. But until Morningside invests in that feature, Turner naps wherever he can. He was also able to take a nap in one of the lesser frequented buildings on campus. 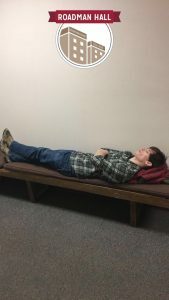 While waiting for a presentation by the applied theatre class he fell asleep in what was being called the “solitary confinement room.” It was a completely barren room on the very top floor of Longfellow School Building with no furniture. Grant’s history with interesting nap locations didn’t start in college. Some of his other crazy nap experiences have taken place in the back room of a Burger King, at least four vehicles owned by Budweiser, the Walmart parking lot, a closet in his high school, the bleachers at a track meet, a river boat, and Mount Vernon. Grant borrows a blanket from a friend as he takes a nap in Dimmit hall. Insomnia is a treatable condition. Treatments include therapy and medication among other non-medical and natural options. The most important part of treatment is to determine the underlying cause of the condition such as stress or medical conditions. For now, Grant will continue his nap quest as a treatment. “I’m not a trained physician, [my habits] probably aren’t healthy, but I’m not gonna stop.” He says that in the future he hopes to nap in the two buildings that he hasn’t been in to round out his nap tour of Morningside. An explosion occurred at Mega City Mall Thursday morning resulting in two fatalities and a number of injuries. Those injured have been transferred to various hospitals around Mega City. Hospitals have reported injuries consistent with fire and smoke inhalation. The Mega City Police Department will hold a press conference at a later date to give more information on this story. On Tuesday the final work of playwright Sam Shepard will be published. It is a story of a man suffering from Lou Gehrig’s disease which blurs the line between fiction and autobiography because Shepard also suffered from the disease. I believe this is a newsworthy story because of the recognizability of Shepard’s name as he was both a playwright and an actor. A number of people will probably recognize the name and be interested in this book. I really liked how this story was written. I enjoyed the way that the author wove in facts about Lou Gehrig’s disease with stories of Shepard’s life and telling the story of how this book came to be. The story here was that this book was being published. It was promoting the book without feeling like a “hey buy my book” story. I really enjoyed the lede of the story it gives some insight into the book while also giving insight into the articles focus on the disease. I also really enjoyed the final little paragraph of the story because it is a little uplifting, heart-strings pulling moment to end a rather bleak story. Overall I believe this story accomplished what it set out to do. It made me want to read the book. I will probably go out and buy this book, even though I am not a book person, because the story of how this book was made and how much attention to detail went into the publication was so interesting to me.